A combination of square stitch and RAW, Kate McKinnon’s corset stitch is the most fun I’ve ever had with beads and a needle. Make that needles. I’m currently on my 4th pack of size 13’s and I have just started the second layer of this cuff! Kate is offering the pattern free on her blog, so jump over and download it today. I was a bit intimidated by Kate’s directions at first glance – they’re narrative with photographs rather than the step-by-step diagram-driven style I’m used to. Once into the project, I realized they were perfect in their fluidity and scale, just like the Corset Stitch bracelet itself! And if you’re into metalwork, there’s a PDF for Kate’s nifty ball-end clasp, too. 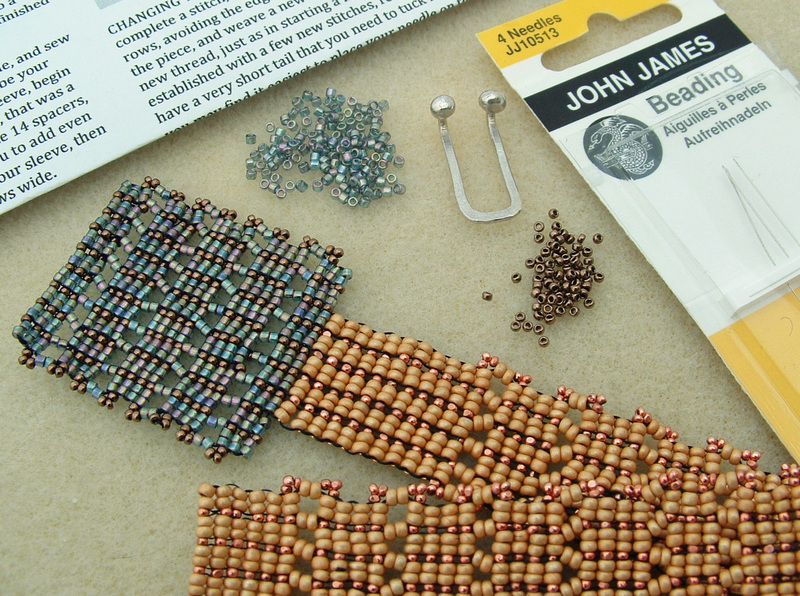 That's a look at what's on my bead table this Wednesday. Head over to the BTW Flickr Group to get a peak at more beaders' work in progress. This is Macaroni and Cheese?